An often asked question about Microsoft Outlook's Business card layout is how to change it for all contacts. While you can't globally change existing contacts directly, you can change the default which is used for new contacts by creating a custom contact form with the desired business card layout and publish it. Set it as the default Contacts form for new Contacts. To apply the layout of the new business card to existing contacts, see Code Sample 3: Change the business card layout to match the selected contact. 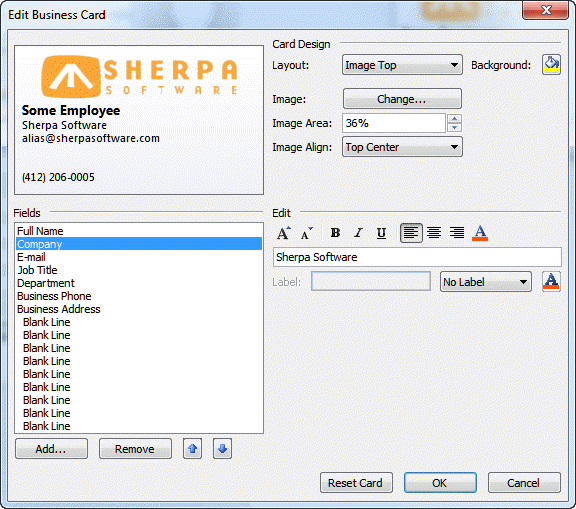 You can edit the business card on individual contacts to add images, background colors, or change the fields displayed. Open a contact then double click on the business card image or click on the Business Card command on the ribbon (visible in screenshot above) to open the Business Card editor. When a contact photo exists, Outlook will use it on the business card or you can add a logo or other image to the card. Use the business card editor to re-arrange the fields, change the font attributes, add a background color, or position the image. Open a new Contact form and edit it as desired. Do not add names, addresses or phone numbers in this form. Change only the business card or other features you want applied to all future contacts. From the Developer tab, choose Publish form as. Right click on the Contact folder, choose Properties and set the newly created custom form as the default form for the folder. When you click New Contact, you'll use this form and all newly created contacts will use the new layout. You can't change the form used by existing contacts, well, you can change the form, but the new business card layout won't be used. Use a tool listed below to change the message class to the new form. See Using Custom Business Cards for more information on how to use a custom business card with new contacts. Hello Diane - I have encountered a problem at my workplace with the migration of Outlook to a different server by our outside IT organization. Before, in the Business Card view, one was able to see all relevant default fields, including a multiple line address. Now, the address field in the Business Card view is truncated and whether two or three lines, all show up as one single line. Need to change this globally, if possible, back to the way it was. Our IT company cannot figure this out. Can you? By the way, when you open any individual contact card, the address displays correctly, and it you click on Business Card within the open contact and double click the address field, the situation corrects itself, but if you don't do this, then all parts of the address meld together in one line when looking at the Business Card view prior to opening contact. They copy and paste the incorrect way too. None of us wishes to open thousands of contacts and correct individually, as the IT company suggests. How did they migrate it? The business card uses the data in the Address field - if you click the address button to open the address checker, are the fields correct? If you type enter after each line in the address field does it fix it? Is so, a macro should be able to fix it. Thank you Diane. I will attempt to find out. Hello Diane! This is Eduardo writing. I've been trying to customize the information shown in all business cards of my contacts. I view my contacts as Business Cards. I basically want to add 2 more fields to the default fields included in the view. I can do it one by one. But, is there a way to do it for all the cards of all contacts? Thank you very much for all the help regarding this issue. Add the fields to one contact then use the macro at https://www.slipstick.com/developer/code-samples/change-the-business-card-layout-using-businesscardlayoutxml/ to update the rest. change the form used by the folder on the folder's properties. Thank you very much for providing instruction on how to customize outlook contact cards. It works. My question: It seems I have lost the original Outlook vcard format. Is it possible to restore the original vcard format so as to toggle between the original vcard format and the new customized vcard format? No. You'd need to change the message class - it not hard using a macro, but could lead to corruption if you do often. and I mean all the contacts, for some reason all the business boxes are checked and not the home boxes they way I had it. Did this happen when your account was migrated to the new server? Can I change the mailing from the business box checked to the home box checked? How do I do that. You can change it for new messages using a custom form... you can use a macro to change existing contacts (and could use a macro to apply it to future contacts). Code sample to make sulk changes is here - https://www.slipstick.com/outlook/contacts/bulk-change-outlook-contacts-file-as-format/ - there is a code sample near the end to change the mailing address. Is there any way I can change the background of the card to a picture instead of a colour? Choose backgrounds image in the layout menu and set it to fit to full screen on the align menu. I've noticed that you can use the "Reset Card" command to change the default appearance of the Outlook Business Card. Can one edit that default card? The VBA to change the appearance is not working in a custom contacts folder.